The Home Bakers is a Baking Event hosted by Joyce from Kitchen Flavours and I’m proud to say I’m a member of the baking family! The aim is to complete all the bakes in a cookbook selected, and this time, and for many months to come, we will be baking from “Coffee Cakes” by Lou Seibert Pappas. The first cake is chosen by Joyce, which is a Cheese-Swirled Chocolate Bundt Cakes. It’s a beautiful chocolate cake with a cream cheese filling, dotted with semi-sweet chocolate chips and chopped walnuts. Instead of buying a bundt pan specially just to bake these cakes, I chose to bake them into cupcakes. I love cupcakes because 1) I don’t have to grease and flour and line any cake pans – which is one of my most hated thing to do; 2) it’s easy to pack and give them out to family and friends; 3) it’s easy to eat – just eat it from the cupcake liner, no need a knife to slice a big cake, plate them then use a fork to eat the cake slice and of course 4) they are really cute to look at! 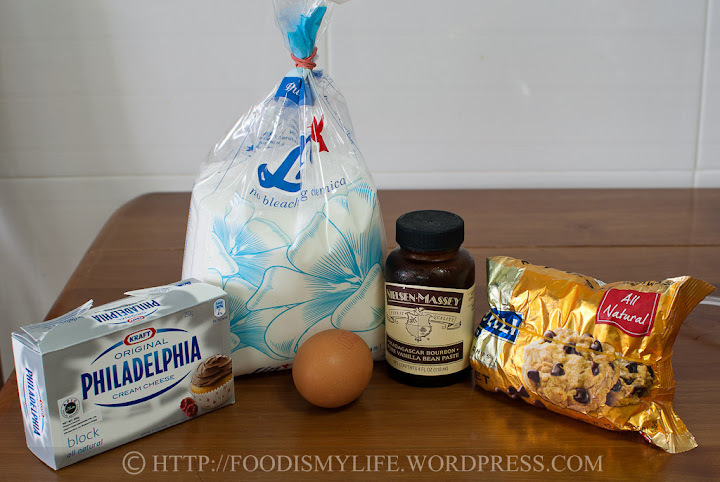 The cream cheese filling is easy to assemble, just whip them all up with a mixer. 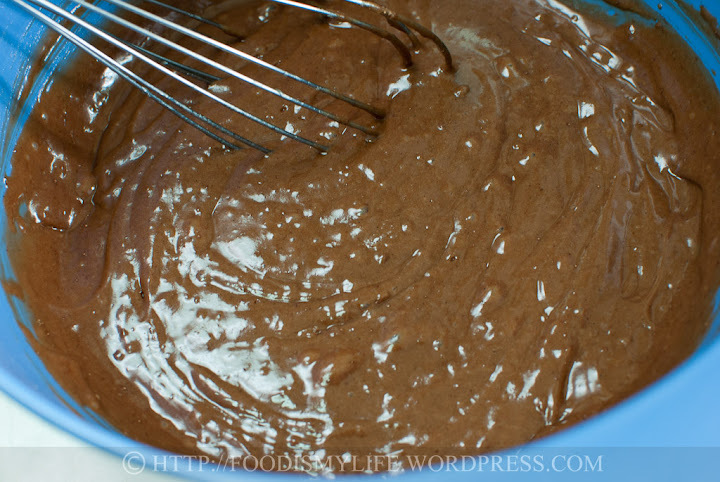 The chocolate cake cannot be any simpler – just whisk the wet and dry separately then mix them together. The insides don’t look very flattering, but it’s pretty delicious! The original temperature stated in the cookbook is 160 degrees Celsius, but I learned somewhere (can’t remember where) that small cakes need to baked for a shorter time and at a higher temperature while bigger cakes need to baked for a longer time and at a lower temperature. Flat cakes (like swiss rolls) need to be baked at a higher temperature and shorter time while it’s the other way round for tall cakes. I think this has to do with the losing of water content in the cake – I guess it’s something like small cakes have lesser water content and if you bake at a low temperature and for a longer time, more water would be loss during baking as compared to a large cake. Similarly, the large surface area of flat cakes will result in more water loss if baked for too long period of time. Please correct me if I’m wrong and I’ll modify here! I test-baked one cupcake without the cream cheese filling for 20 minutes at 175 degrees Celsius and it rose beautifully, but the texture was really dry – like eating chocolate bread. So I reduced the temperature to 170 degrees Celsius and baked them for 18 minutes. There are some tiny bit of crumbs sticking onto the skewer but I removed the cupcakes from the oven anyway and let them bake with the residual heat within themselves. I think the cream cheese filling gave some moisture away to the cake because the cake near the cream cheese filling is moist while the cake at the bottom (far from the cream cheese filling) is light and soft, not dry but not very moist either. In terms of taste, I think the cake itself has a nice aroma and a good chocolate flavour, but it’s not chocolatey enough for me. The chocolatey part was made up with the addition of the semi-sweet chocolate chips, so a good quality brand of chocolate chips should be used. 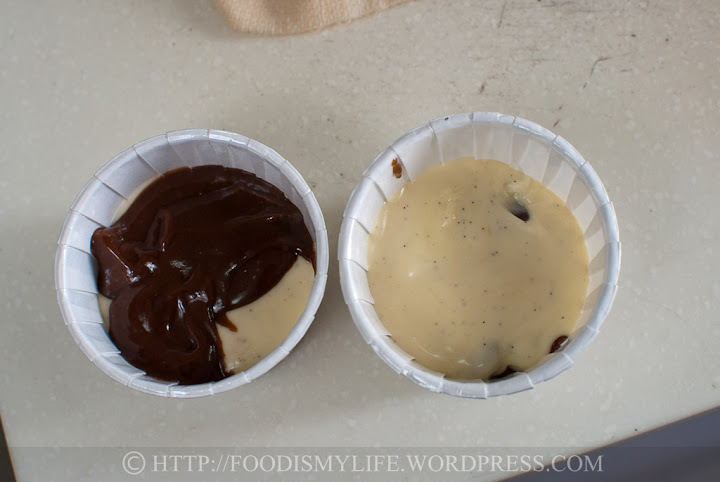 I reduced the sugar in the chocolate cake batter, as the semi-sweet chocolate chips add a some sweetness to the overall cupcake. 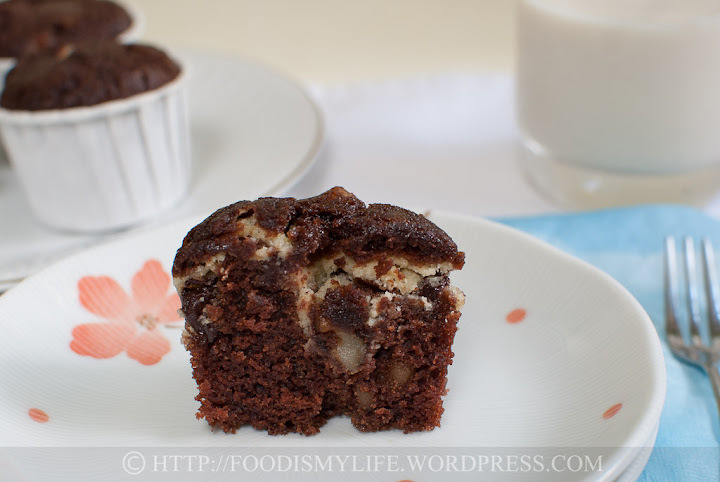 3) Double up the cream cheese filling and swirl it around the chocolate cake batter instead of making it a filling. 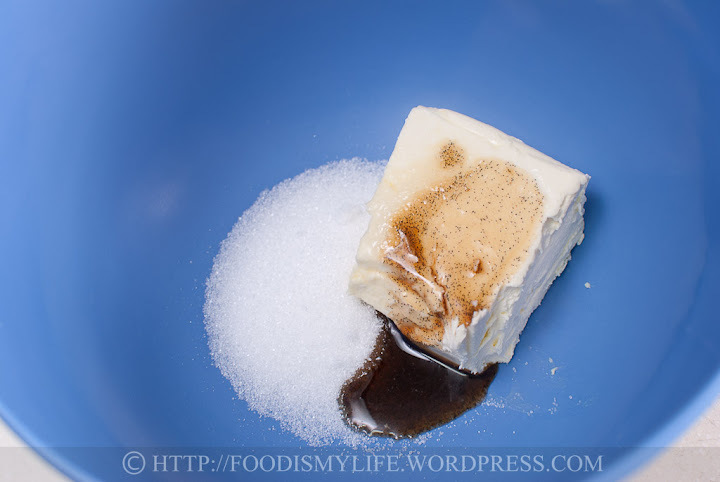 115 grams of softened cream cheese with 25 grams sugar and 1/2 teaspoon vanilla extract. I invested in vanilla paste recently, hence there are little dots in the vanilla (those are vanilla seeds!). Cream them with a mixer and beat in 1/2 an egg. 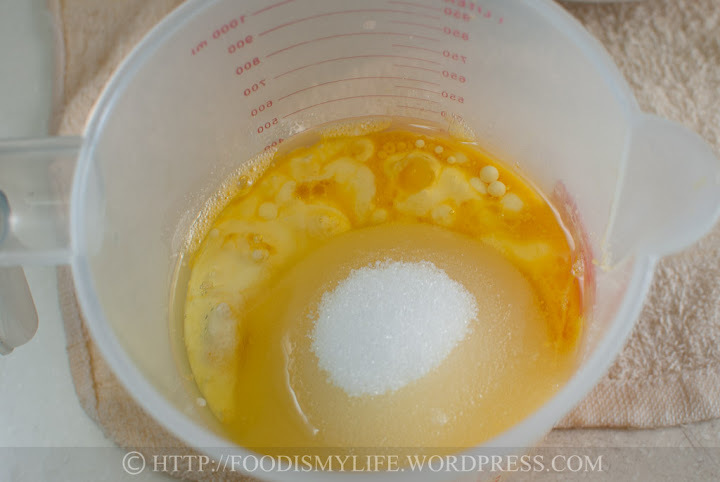 To measure 1/2 an egg, weigh one cracked egg in a bowl. 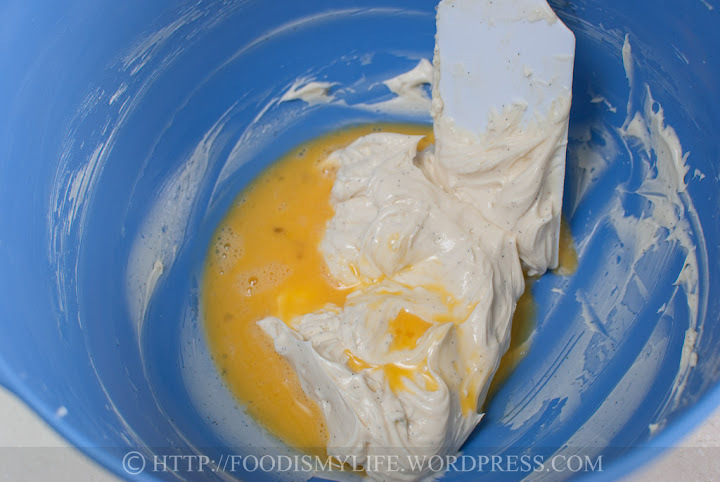 Whisk with a fork and add in 1/2 of it into the cheese filling. My favourite chocolate chips brand is Ghiradelli. They come in semi-sweet and dark in my local supermarkets and I loved them so, so, so much! Do use a good brand of chocolate chips because they make a difference. 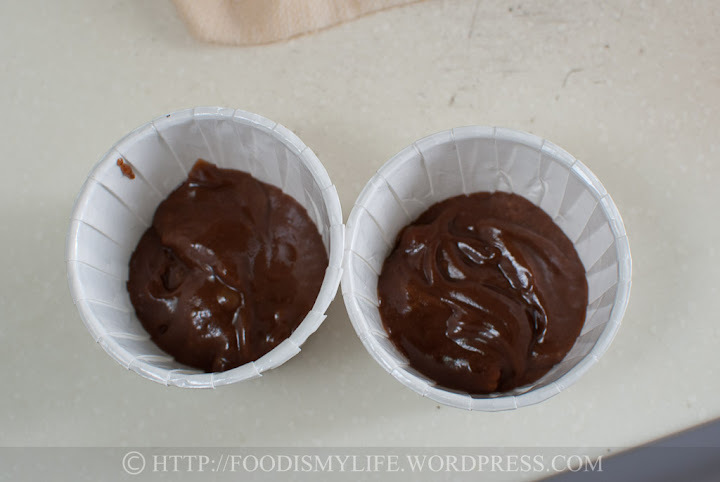 185 grams plain flour, 25 grams cocoa, 1 teaspoon baking soda, 1/8 teaspoon salt. As mentioned earlier, I used Hershey’s cocoa, which is natural and acidic. 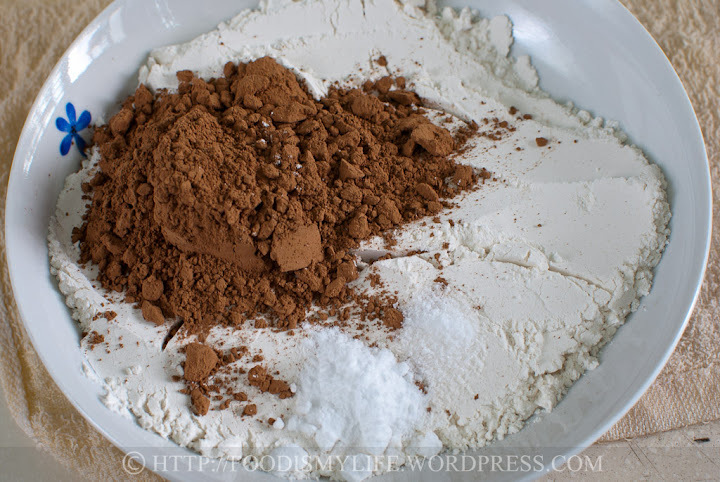 If using a Dutch-processed cocoa powder, substitute 1/2 teaspoon baking soda with 1/2 teaspoon baking powder. 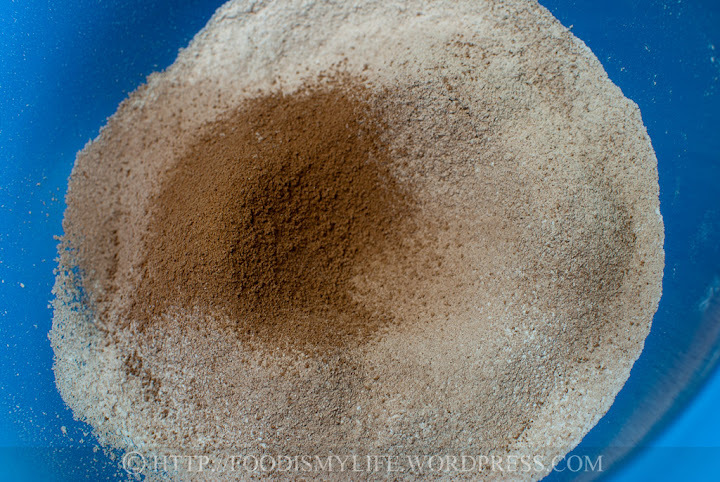 Sift the flour mixture into a big bowl. This step was not mentioned in the cookbook, but I like to sift all my flour mixture because it get rids of all lumps (especially in cocoa powder). 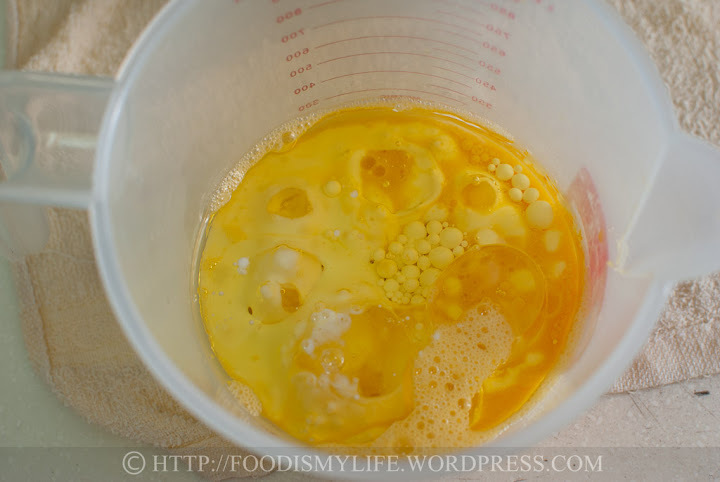 Measure 1 egg, 125 ml oil and 125 ml buttermilk in a measuring cup. Use vegetable oil or any neutral-flavoured oil so that it will not affect the taste of the baked goods. I used a light olive oil, which is not as strong as those Extra Virgin ones. However, because the cocoa taste is not very strong, I think I can taste a hint of the olive oil, will definitely try it out with vegetable oil the next time. To make a cup of buttermilk, add in 1 tablespoon of lemon juice or vinegar in a measuring cup. Top up with fresh milk until it reaches the 1 cup mark. 1 cup is about 250 ml. So in this case, use 1/2 tablespoon of lemon juice or vinegar and top up with fresh milk until it reaches the 1/2 cup (125 ml) mark. If you have no lemon juice or milk on hand, use plain yoghurt, it will work well here too. Whisk in 175 grams sugar. I reduced the amount of sugar from 225 grams to 175 grams. Add the wet ingredients to the dry ones. In the original recipe, the wet ingredients are all combined except for buttermilk. Then flour mixture was added, followed by buttermilk, then flour then buttermilk and then flour (dry-wet-dry-wet-dry). I was lazy, so I decided to do it differently. After some research, I found out the reason for the dry-wet-dry-wet-dry adding method. 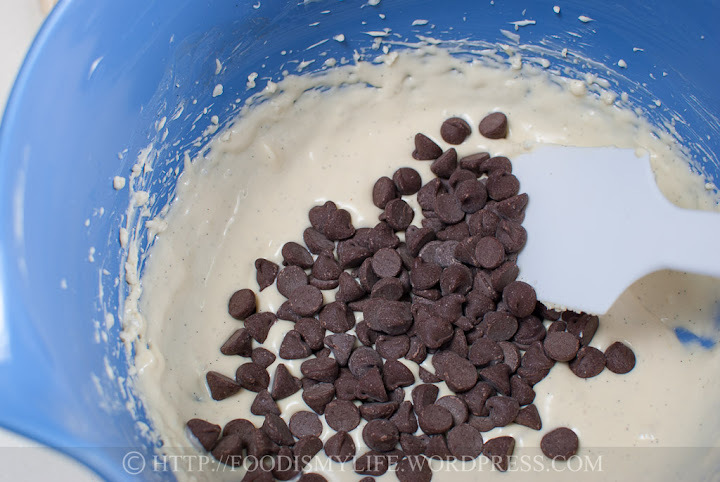 The creamed mixture contains fat (usually butter, sugar and eggs), and adding the dry ingredients will allow the fat in the creamed mixture to coat the flour particles, avoiding the development of gluten. Gluten is breads’ best friend and cakes’ worst enemy. Gluten is a type of protein that will make cakes tough and chewy. 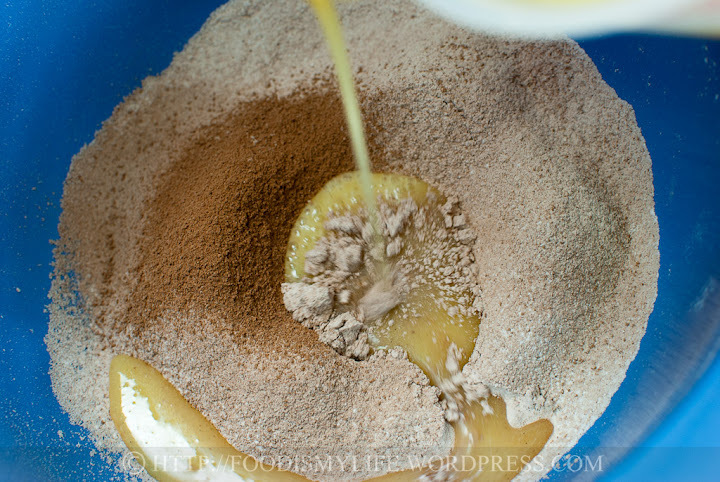 Adding the dry ingredients at the end is to absorb any available moisture in the batter. I solemnly and sincerely swear that I will not be lazy in the future. Luckily my cupcakes came out soft and moist despite my laziness… not chewy like a bread! Whisk them all up gently. 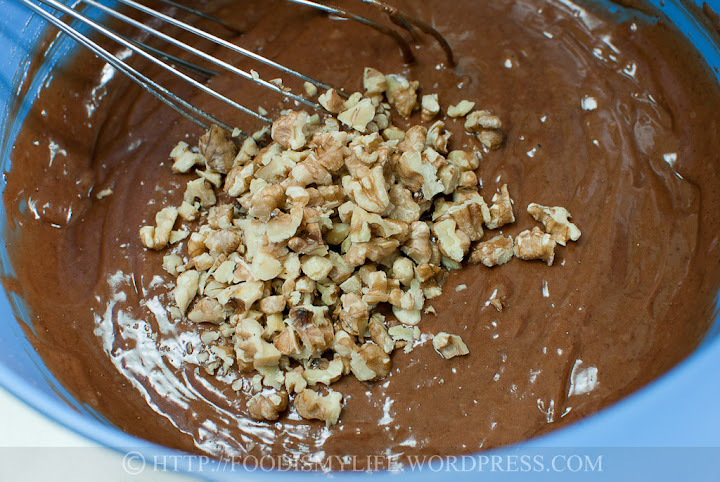 Mix in 40 grams of chopped and toasted walnuts. For nuts-non-lovers, you may omit the walnuts. To toast the walnuts, preheat the oven to 175 degrees Celsius. Line a baking tray with aluminum foil. Spread the walnuts on the baking tray in a single layer and toast them for 5-10 minutes until the nuts are fragrant. Do not let them burn. Remove, let them cool and chop them into desired size. 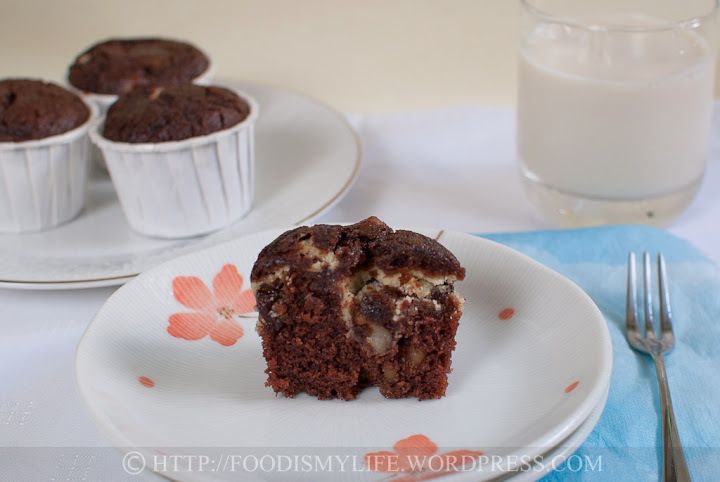 …1/4 of cream cheese filling and slightly under 1/4 of chocolate cake batter. Fill the cupcakes up to 2/3 or 3/4 full. I get about 18 cupcakes from all the cake mix. Bake at 170 degrees Celsius for about 18 minutes. These cupcakes taste good both warm and at room temperature. But I find that the flavours really developed the next day (or maybe because I was hungry?) 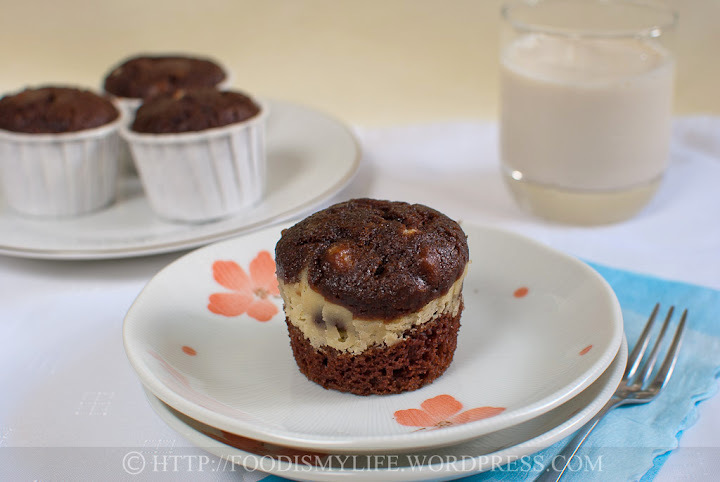 They are perfect cakes to pair with coffee or tea, but I love them exceptionally with a cup of cold soya milk. Hop over to here to check out others’ bake! EDIT: I baked half the cake and yielded about 18 cupcakes, do pop by to Joyce’s (Kitchen Flavours) blog for the full recipe. Oh it’s okay! I agree, I like to bake minis so that’s it’s easier to give it out. Thank you for the compliment, hope to see your bake soon! I am so sorry, I am behind on my bakes but hopefully, I will catch up. I was thinking of baking this recipe in minis, as well. A big cake is usually a waste in my house. On the other hand, maybe, I can make this for company and make a bundt. Yours look scrumptious. I love anything with a swirl or filling. Yes it’s fun and I learned something new from this bake! Do join in if you can! 🙂 I hope posting the suggestions will help others to note the things to look out for when they bake this cake. Thanks for stopping by! I loved how you thought of the problems and provided suggestions to make the recipe better next time. 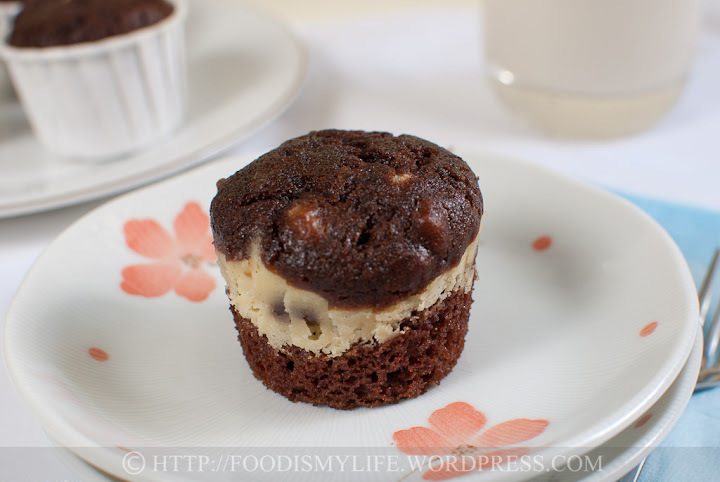 I love the mixture of sweet and savory elements in this cupcake, great recipe! Aww that’s so sweet of your mom. Mine has cheesecake peeking out at the sides so it’s not really a surprise, but I’ll definitely try to keep it in the middle for a surprise factor next time! Thank you and take care! I like the chocolate and cream cheese combi too, but i find there’s Not enough cream cheese, maybe I will increase the cream cheese filling next time. I’m not sure I’ve seen that brand of cocoa powder in my local supermarkets… I will keep a look out! Adding melted chocolate is a great idea, but I will need to research on the substitution before I try it again (: thanks for the suggestions! Thank you Alice, I’m glad the photos are helpful! Your comment will encourage me to try to post step-by-step photos for all my posts (: thanks for stopping by! I really like your cupcake variation on the bundt cake! They look delicious, but i reccognize the kind of dry texture of the cake. And think your tip of adding more liquid of swirling true the cheese both ideas might help i think. Those look delicious. It may sound strange to a non-foodie, but you can really tell your love of food by the pic of adding the wet ingredients into to dry. I love that pic! My mom used to make something like this when I was growing up and the cream chees was hidden like a yummy surprise. I love chocolate and cheesecake together so rich and yummy. These look like a version of chocolate cake V cheesecake which is interesting. I guess a darker cocoa would make them more rich I use Green and Blacks but I am not sure you can get that outside of the UK. What about adding melted dark chocolate? These look fantastic. The swirl is so whimsical! hi jasline, i also find mine not chocolatey enough and wished it could be a little richer. 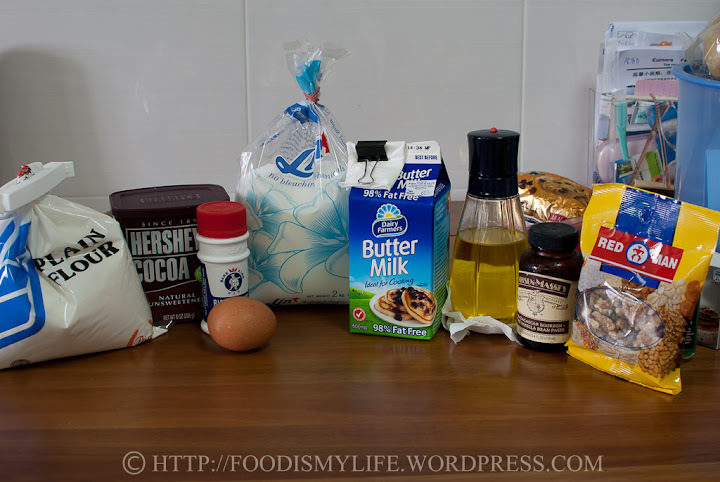 If i were to bake this again, i guess i would have to use butter instead of canola oil and use a different cocoa powder. I used the hersheys one too. This looks like such a fun event.. and I look forward to seeing everything you bake over the next little while:) Your first one is a two thumbs up! I think we have both mislead by the skewer test! I did the same and my cake turned out to be dry too. I reckon I must tested the chocolate chip and thought that the melted choco chip is the “uncooked dough”. I’m still thinking if I should post my cake as I’m actually quite disappointed with my bake.